You don’t have to live in low-population areas to participate in the 2018 National Rural Assembly’s Building Civic Courage event May 21st - 23rd in Durham, North Carolina. The theme of this year’s theme is “Building Civic Courage” and several experts in broadband, including our Christopher Mitchell, will be speaking at the event. You can still register online. The purpose the Assembly is to build a common, community-focused rural agenda based on participation of local, state, regional, and national rural leaders; empower rural leaders and their allies to educate policy makers about this agenda; and raise the national visibility of rural issues. The focus of this meeting will be how we build a more inclusive nation, viewed through a lens of civic courage. We'll explore a number of questions, such as: What does civic courage look like? Why is civic courage important for achieving policy change? How are rural people strengthening our democracy? How do we amplify wise, diverse, and informed rural voices in ways that promote better policies? At the heart of the rip-off in this investigation is Frontier’s habit of advertising speeds that it cannot provide. The WLOS crew traveled to a home in a mountainous area of the region to visit Craig Marble, who moved from D.C., and works from home in the tech field. “It's just a comedy of errors except that it's not funny. It takes five minute to load a single webpage,” Marble said. “If you can get good speeds in the middle of the night, but not during the day, I think that's deceptive advertising to be suggesting to people that they can get those speeds,” said Christopher Mitchell, director of Community Broadband Networks at the Institute for Local Self-Reliance in Minnesota. Mitchell says, companies shouldn't advertise what they can't offer. This is the transcript for Episode 280 of the Community Broadband Bits podcast. Christa Wagner Vinson, Deborah Watts, and Alan Fitzpatrick join Christopher Mitchell at the Atlanta airport to discuss the work of NC Hearts Gigabit and how they're organizing for local choice and better connectivity. Listen to this episode here. Deborah Watts: And you know we need we need to get regulations in legislation that prevents local choice out of the way these people on the tractors the ones in the production rooms the ones in the businesses that can go to their representatives and say You all need to do something about this because I'm having difficulty running my business. I can't be competitive. Lisa Gonzalez: You're listening to episode 280 of the Community Broadband Bits podcast from the Institute for Local Self-Reliance. I'm Lisa Gonzalez. 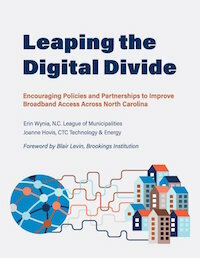 Christopher recently attended the broadband community's economic development conference where he was able to connect with this week's guests from North Carolina Christa Wagner Vinson, Deborah Watts, and Alan Fitzpatrick from the group and NC Hearts Gigabit joined Chris to talk about local choice and better connectivity in North Carolina and how they're using technology to bring people together. Catharine Rice from the Coalition for Local Internet Choice was also there in this conversation. You'll learn how and see how it's gigabit began. Who's involved. What they've accomplished their goals and you'll also hear some tips on the best way to get the word out and get organized. You can learn more about the group. Check out the collection of resources and even join up at their website and see hearts gigabit dot com. Here's Christopher with Christa Wagner Vinson, Deborah Watts, Alan Fitzpatrick, and Catharine Rice. Christopher Mitchell: Welcome to another edition of the Community Broadband Bits podcasts. I'm Chris Mitchell with the Institute for Local Self-Reliance in Atlanta sitting on the runway of the Atlanta airport at the Broadband Communities Conference talking to you now with three folks from an organization called NC Hearts Gigabit I'm going to start by introducing Christa Wagner Vinson, the economic development consultant of the group. Welcome to the show.